Fans of late night talk shows are in for a treat when “The Nite Show with Danny Cashman” comes to the Westbrook Performing Arts Center for a one-night taping on Friday, April 13 at 6 p.m. Tickets are free for anyone interested in attending. Friday’s show tapings in Westbrook will give students a valuable opportunity to work on a multi-camera entertainment program recorded “on location.” Ordinarily, “The Nite Show” with Danny Cashman is recorded at Husson University’s Gracie Theatre in Bangor. There are high expectations for students participating in this production since the show will be seen on broadcast television stations throughout the state. Broadcast statewide on Saturday nights, the show can be seen in Portland at 7:30 p.m. on WGME CBS 13, and at 10:30 p.m. on WPFO, FOX 23. In Bangor, the show is broadcast on Saturday nights at 11:30 p.m. on WABI-TV5 (CBS) and in Presque Isle on Saturday nights at midnight on WAGM FOX 8. “The Nite Show with Danny Cashman” is the number one rated show on Saturday late nights in Eastern and Central Maine through WABI-TV in Bangor according to Nielsen (November 2017 ratings). 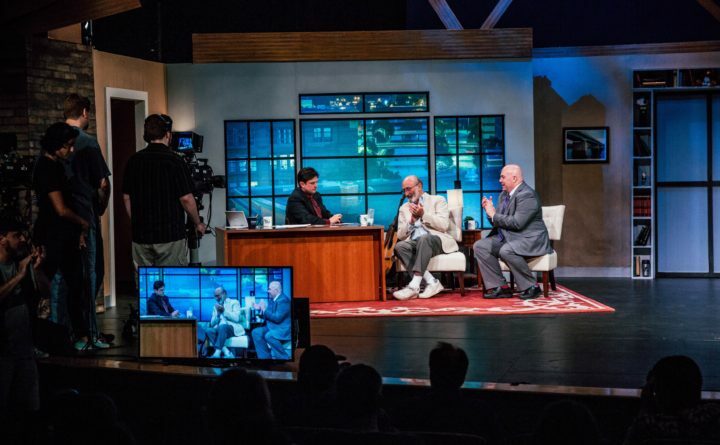 Just this week, “The Nite Show” was nominated for its seventh New England Regional Emmy Award. “The Nite Show” is Maine’s version of a late night talk show, featuring a monologue, comedy bits, guest interviews and performances. Modeled after shows done by Johnny Carson, David Letterman, and Conan O’ Brien, the 30-minute weekly show also features a five-piece house band (Brian Nadeau & The Nite Show Band), a live announcer (Joe Kennedy), and many elements familiar to late night television viewers. The show originates from Husson University’s Gracie Theatre with a live studio audience and is broadcast statewide on Saturday nights. It is one of only two shows of its kind in the entire country. Guests that will be appearing on “The Nite Show” in Westbrook this Friday will include former Maine Governor John Baldacci, David Letterman’s longtime warm-up comic Eddie Brill, and Grammy Award winning singer/songwriter Paula Cole. The taping begins at 6 p.m. on Friday, April 13 and audience members are asked to arrive by 5:45. Tickets are free, but must be obtained on “The Nite Show” website at http://www.theniteshowmaine.com and clicking on the “Tickets” tab at the top of the page.